Last year I featured the movie version (sung by Adnan Sami for Bajrangi Bhaijaan) but when I visited YouTube this morning I noticed some commenters politely asked that the poster (T Series) include a credit to the legendary Sabri Brothers, who composed the qawwali and first sang it. In the Sabri version the traditional slow prelude, which fidgety moderns have difficulty sitting through, might be a tad longer than the movie version but the Sabri Bothers get to rollicking soon enough. Here's both versions, to blow away the cobwebs of political squabbles and the daily grind of war news. By the way I think I mentioned last year that Adnan isn't a qawwali singer, but all agree he did a great job with "Bhar Do Jholi Meri." A true singer, it's been said, can sing anything. That would certainly apply to Adnan Sami because it's no easy task to do justice to a qawwali. 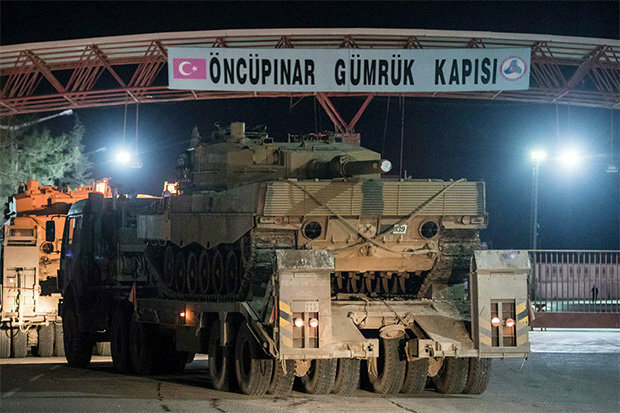 From a headline today at the (U.K.) Daily Star, "Turkey INVADES Syria – tanks and soldiers cross the border: TURKISH military forces are invading Syria after pounding the war-torn country with airstrikes" and backs up the report with a photo (above) and video footage of Turkish tanks rolling across the border. Given that the British military, as part of NATO, initially invaded Syria on trumped-up charges and did so under protest from Damascus, one has to take the Daily Star's umbrage with a grain of salt. The headline from Russia's Sputnik is more sanguine but couldn't resist highlighting the irony of Ankara's labeling of the invasion: "Operation Olive Branch: What Happened in Syria Today?" Note, however, that the Turkish minister didn't actually say his government had already notified Syria's. He said, implied, that they were in the process of preparing a notification in writing. It came just hours after Turkey [launched] airstrikes in Afrin, with the military claiming it had hit 153 targets so far, including shelters and hideouts used by Kurdish militants. Turkish President Tayyip Erdogan's spokesman, Ibrahim Kalin, wrote on Twitter: "In its second day, Olive Branch Operation continues to ensure peace and security for our people, protect Syria's territorial integrity and eliminate all terrorist elements in the region. YPG official Nouri Mahmoudi, said "all the Turkish military's ground attacks against Afrin have been repelled so far and they have been forced to retreat." One claim, however, can be taken as perfect truth, which is that YPG is indeed backed by Turkey's fellow NATO member, the United States. And so, I will assume, it's also backed by NATO member Britain. This would explain the Daily Star's outrage and also Turkey's attempt to brand a clear attack on Syria as a peacekeeping operation. This is not the first time we've seen the snake eating its own tail in the Syrian War; in fact the entire invasion of Syria, conducted largely by proxy forces, has been based on untruths ranging from exaggerations to outright lies. As to where this has led if we don't count the destruction of the country's infrastructures and God Knows how many Syrian innocents killed -- for one thing, it's led to a recent claim by Qatar's government that they never actually supported the Muslim Brotherhood; no, the government of the United States of America supported the Brothers and Qatar simply went along with the support to please the Americans. To my knowledge no spokesperson for Al-Thani's regime has come right out and told such a big lie; they've done it through cutouts. But there you have it: once again, the United States of America is left holding the bag. However, given that U.S. machinations in Syria have been predicated on one untruth after another, and that the U.S. government indeed gave at least some support to the Brothers for many years (and, it has been argued, initially helped create the organization), Qatar considers it okay to place blame on the American government for the Muslim Brotherhood's predations in Syria and elsewhere. Just as Ankara considers it okay to betray its alliance with NATO in the name of defending a "safe zone" in Syria. But that excuse puts Turkey in line with the Responsibility to Protect doctrine. That the doctrine is by now rejected by observers with integrity, on the basis of solid evidence it can be used by liars as an excuse for invading a country and toppling governments -- the rejection came too late in the day for the Libyans and Syrians. Only Al-Thani's incredible financial wealth, and skill in using it for defense, saved Qataris from the same fate. "We are in control. We know everything. ... There is no cause for alarm." What with the story about a wrong-button pusher in Hawaii this is a very bad week for governments to attempt to assure the public they are in control -- although I must say Dr Atwine's wonderfully emotional declamation should get a prize for Most Convincing Assurance that government is leaving no stone unturned. So is this is a new, highly infectious deadly disease, or an outbreak of hemorrhagic fever? Either way, the incident underscores that officials trying to cover up or downplay an infectious disease outbreak is so last century. In this century of globalized 24/7 news and social media, governments the world over are being forced to the realization that they must somehow thread the camel through the needle: keep the public well informed about a possible infectious disease outbreak but without setting off or adding to a panic. A NEW disease is feared to become even more deadly than the Black Death that killed thousands in 2017 after it killed a nine year-old child. "In Washington last month, I was told that a main strut of U.S. Syria policy going forward would be marshalling America’s international and regional allies to isolate the Assad regime economically. America is meant to play a key leadership role in this effort, reinforcing international consensus on an economic blockade of Assad. The idea is to use economic leverage on the regime and its ally Russia, in parallel with diplomatic pressure, to push for a transition and Assad’s removal." “We are confident that the fulfillment of these [Geneva] talks will produce a Syria that is free of Bashar al-Assad and his family,” wrote Secretary of State Rex Tillerson in The New York Times on Dec. 27. As I argued recently for the Century Foundation, this will not work. In short, nothing has changed about U.S. involvement since 2011 in the attempts to remove Assad from power, and it's demonstrated a willingness to see Syria reduced to ruins in order to accomplish the goal. Yet one never hears about the U.S. attempting to remove the Baathists from power. This is curious given that much of the Syrian opposition is actually against the Baathists, who were in power long before Bashar al-Assad was installed as the figurehead leader of the party. So why the ongoing American focus on removing Assad? Because Assad is completely committed to Syria's government remaining secular, as are most Syrians, and Al Saud can't tolerate a genuinely secular society in the Middle East -- one that puts Sunni Islam on par with other religions and Islamic sects. To whatever extent possible the United States serves Saudi interests. Any other American reasons for wanting Assad removed are distant seconds. All things being equal, Assad would still have to go because he stands as a bulwark against sectarian rule of Syria. However, it may actually turn out that the protests are driven by Iran’s hardliners and Islamic conservatives, who are challenging the presidency of Rouhani, who is considered a “moderate”politician in the Islamic Republic. The Iranian city of Mashhad is one of the places where the protests initially started. [Ahmed Al-Burai, a lecturer at Aydin University in Istanbul] explained that it is actually a “stronghold of Rouhani’s major competitor” at the last presidential elections, Ebrahim Raisi. Raisi is the son-in-law of the Mashhad Friday prayer leader and Grand Imam of Imam Reza shrine, Ahmad Alamolhoda. The quotes are from RT's Jan 1 report "Trump's support will not be welcomed by Iranian protesters", which begins by pointing out the obvious, which is that many Iranians -- including many of the protesters -- positively hate the United States. In fact, so widespread is the hatred that Rouhani was probably not talking through his turban when he claimed that "foreign provocations" are a factor in the protests -- although he admitted what is also obvious, which is that "domestic problems" are also in play in the protests. Now it would be exaggeration to say that American intelligence agencies and think tanks couldn't correctly analyze the doings in so much as a foreign chicken coop. There are some very knowledgeable American and foreigners working for the U.S. government who are skilled analysts of foreign affairs. The caveat is that their hard work is often ignored by factions in Congress and the American Administration, which are usually so busy squabbling about each others' agendas that finally no one can untangle what is actually happening in the situations under analysis. Upshot: The U.S. wades blindfolded into situations in the Middle East and elsewhere in the world, making a mess that it then tries to 'fix,' which makes a bigger mess. I emphasize that in the Middle East the U.S. generally doesn't wade in alone; it's works in tandem with NATO members, notably U.K. and/or France, and allies in the Arab oil countries, and with Israel sometimes bringing up the rear but more often complaining that nobody is listening to their advice. The most annoying part for Americans, at least those Americans who have some idea of what is actually going on, is that despite the group effort, it's invariably the United States that is left holding the bag when the messes turn into crises. Some will argue that U.S. defense policymakers are very clear about what is really going on in Iran but that even if the political hand behind the current protests is Iranian Islamic hardliners, the optics of the protests fit well with American propaganda against Tehran's regime. I'd reply to such people by asking what century they believe this is. The weaponization of street protests by foreign powers is so well known in this era -- recently one American analyst sarcastically referred to the tactic as "renta rallies" -- that the smart move for an American administration is to completely distance itself from even a hint of involvement in foreign protest rallies. But that would mean getting a handle on factions in Congress which are infamously known as instigators of phony democracy revolutions to install U.S. puppets in power. In the Herculean task I would wish President Trump, and any American president, the very best of luck and a tripled security detail.